These key lime pie cupcakes are like upside-down key lime pies. The cake (the bottom part) is moist and intensely key lime-flavored (prepare to pucker your lips) and the frosting (the top part) is packed with crushed graham crackers (store-bought or homemade) so you feel like you’re eating a graham cracker crust on top of the cake. If you are not going to make homemade graham crackers, I suggest checking the box before you buy store-bought ones. It’s surprising how many of them contain high-fructose corn syrup. This is a nice brand to use if you can find it. These key lime pie cupcakes are like upside-down key lime pies. The cake is moist and intensely key lime-flavored and the frosting is packed with crushed graham crackers. In a medium-sized bowl, cream butter and sugar. Mix eggs into butter/sugar, one at a time. Mix sweetened condensed milk and key lime juice into wet ingredients. Mix dry ingredients into wet ingredients until just combined. Divide evenly between 12 cupcake liners. Note: The batter will be very liquidy. This is normal. Bake at 350 F for thirty minutes or until cupcakes bounce back when touched lightly. The center will still be wet. It solidifies as it cools. In a large mixing bowl, mix butter and cream cheese until light and fluffy. Mix in the powdered sugar a little bit at a time. Note: You can add more if you prefer a stiffer consistency. Haven’t You Made Key Lime Pie Cupcakes Before? I made key lime pie cupcakes back in ’08 and just like it’s a good idea to dust off your shelves every three years (oh, am I supposed to do that more often? ), I decided that the recipe could use a little freshening. The original key lime pie cupcake recipe was a huge crowd pleaser, but I wasn’t happy with the graham flavor. I baked the graham crackers into the cake and you couldn’t really taste them. I also didn’t like that the frosting required a very difficult to find ingredient – lime extract. 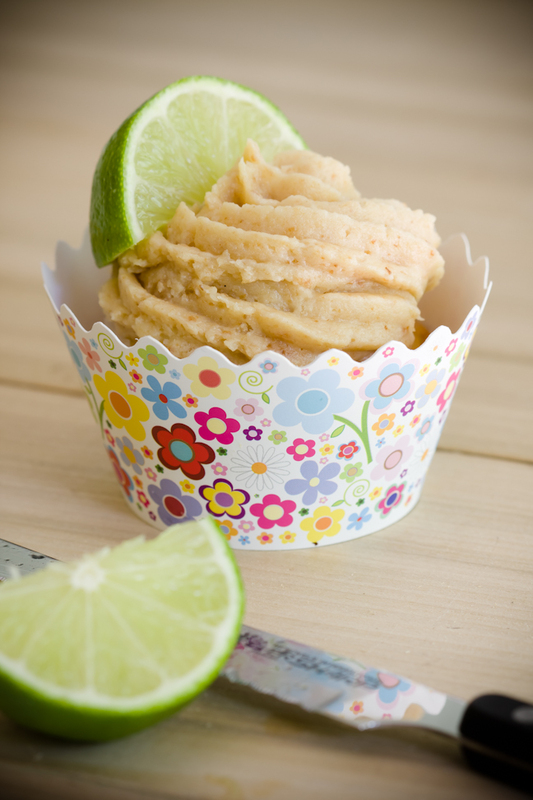 My latest key lime pie cupcakes feel fresh, new, and Spring-cleaned! The wrappers on these key lime pie cupcakes were a gift to me from cupcakewrappers.com. Aside from the fact that I adore the pattern, I LOVE that you can wash the wrappers and use them again and again! Why didn’t someone think of this before?